Looking for fall decorating ideas? 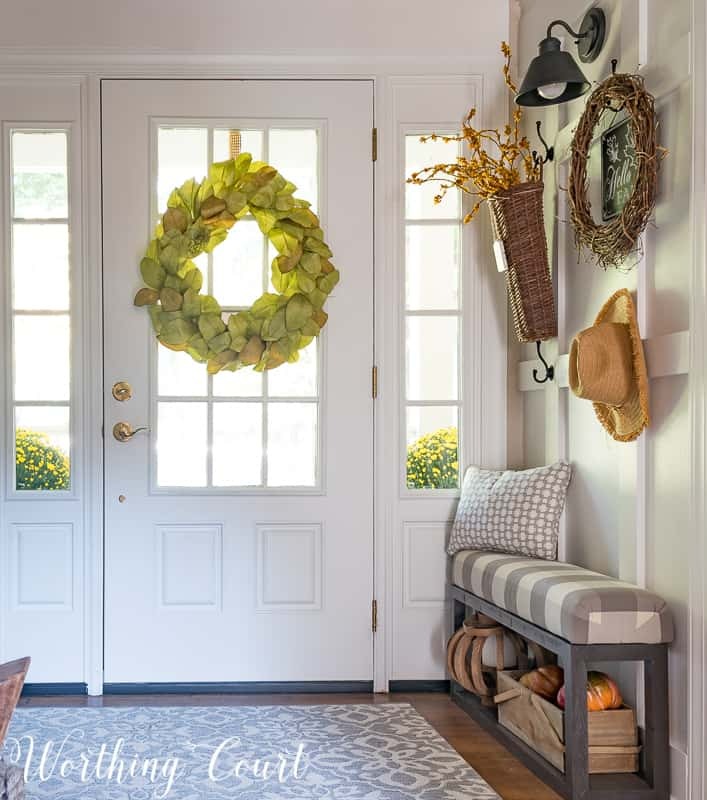 These simple and easy fall foyer decor ideas will create a “welcome to my home” vibe for your friends and family. No matter the time of year, it’s important to me that my foyer always be a warm and welcoming area in my home! Almost everyone who comes to visit us usually comes to the front door and I want them to feel instantly at home. Keeping that in mind, my fall foyer decor this year is filled with warm colors and soothing textures. Nothing jarring or overwhelming would do in this space. Come on in and look around! As soon as you enter through the front door, I’ve set up a little welcoming vignette. Even though the chair is filled with throws and a fall pillow, I hope it will give my visitors the impression that I’d like you to sit and stay for a while! 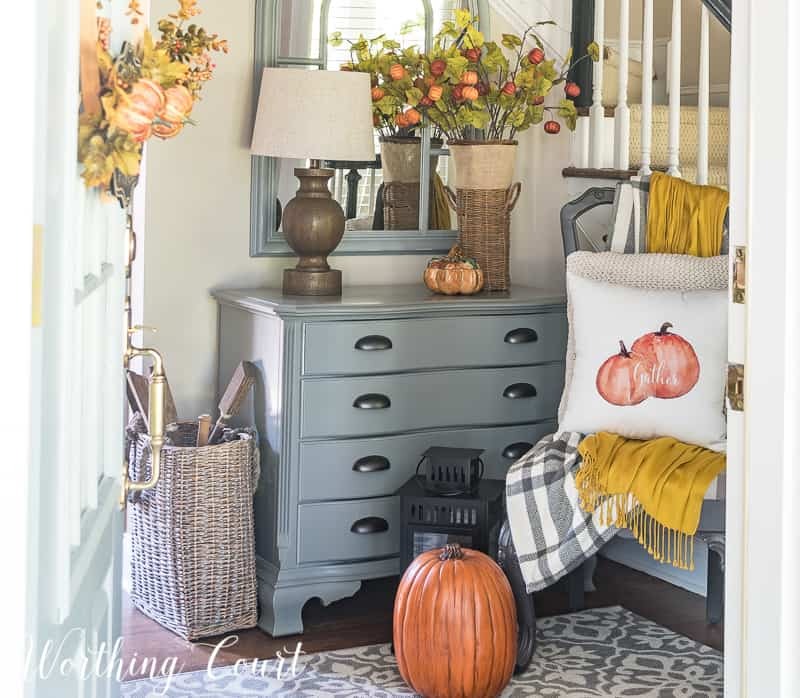 To keep the whole area from feeling too busy, I kept the fall decor on the chest very simple by only adding a wicker vase filled with fall stems and a cute little crockery pumpkin box. How cute are those pumpkins stems? Can you believe they came from the dollar store? I kept the decor on my board and batten wall really simple too. I removed much of what was on this wall for the summer and added just a few touches for fall. The hooks that I added to the wall make hanging seasonal decorations here a cinch. Thank you for coming by to take a look at my fall foyer decor today. 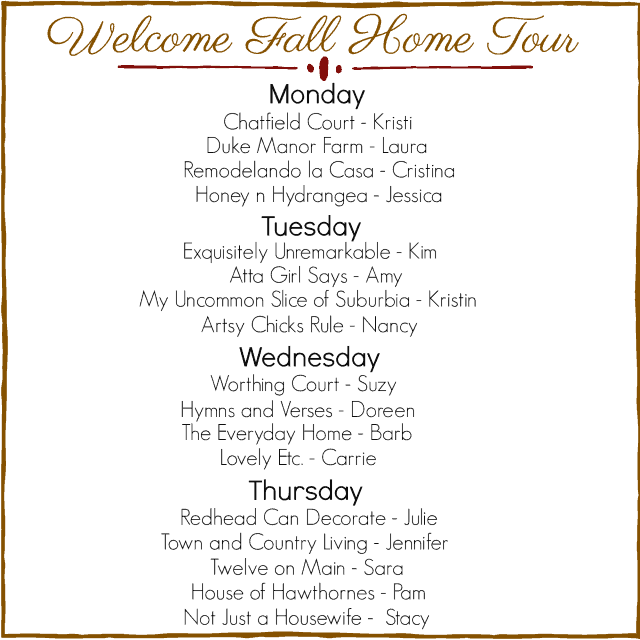 I’m happy to be participating in the Welcome Fall Home Tour with several of my bloggy friends! We’re all sharing our Welcome Fall ideas every day this week! A huge thank you to Kristi from Chatfield Court for putting these tours together! 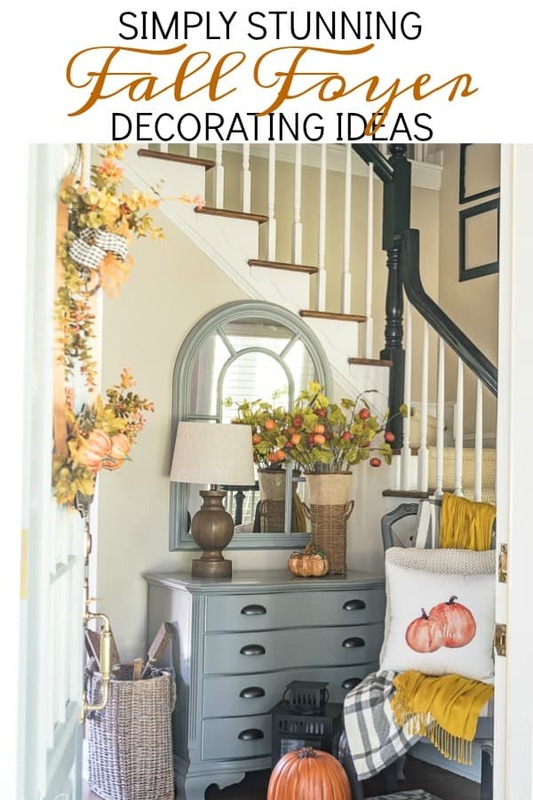 Click on the links below to get tons of fall inspiration for your own home! Worthing Court / Hymns and Verses / The Everyday Home / Lovely Etc. 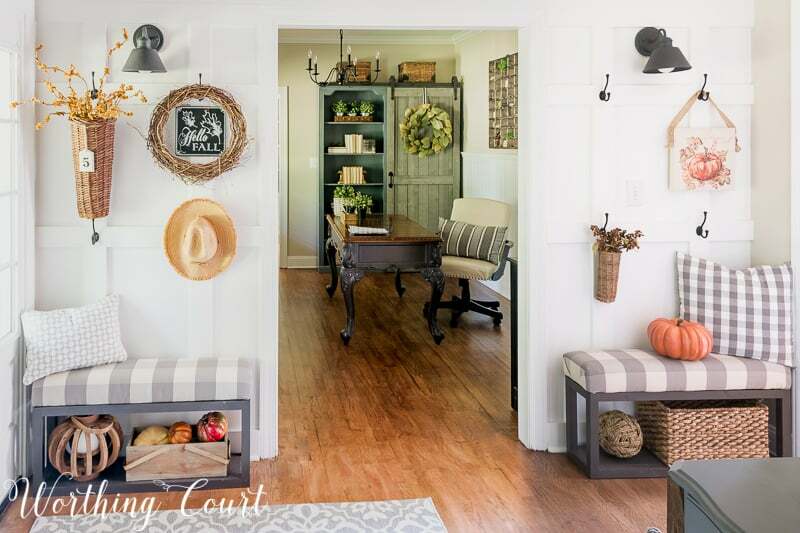 Love your entryway all decorated for fall, Suzy! It’s so warm and welcoming., just like the rest of your beautiful home. Thanks for being a part of my fall home tour. What a beautiful home you have, Suzy. I love those pumpkin stems, absolutely charming. Suzy that is gorgeous!!! Love the board and batten and those benches are great! Looks so pretty Suzy. And, those pumpkin stems are so cute. And a dollar?!!! 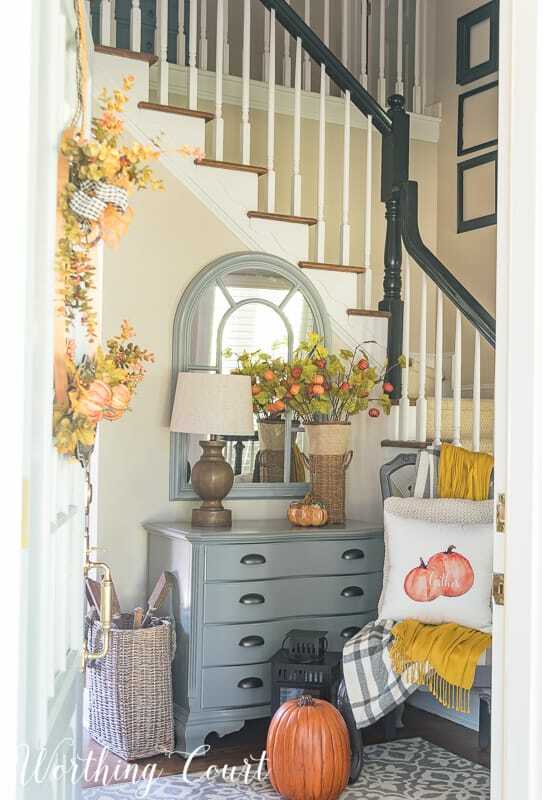 Love all of the fall touches in your entry way – so warm and welcoming. I love your fall foyer! And those pumpkin stems – too cute! I love the hooks on the board and batten. It must be so much fun to decorate them for the seasons! This is beautiful!!! Your fall touches are just right. I love how you accesorize. 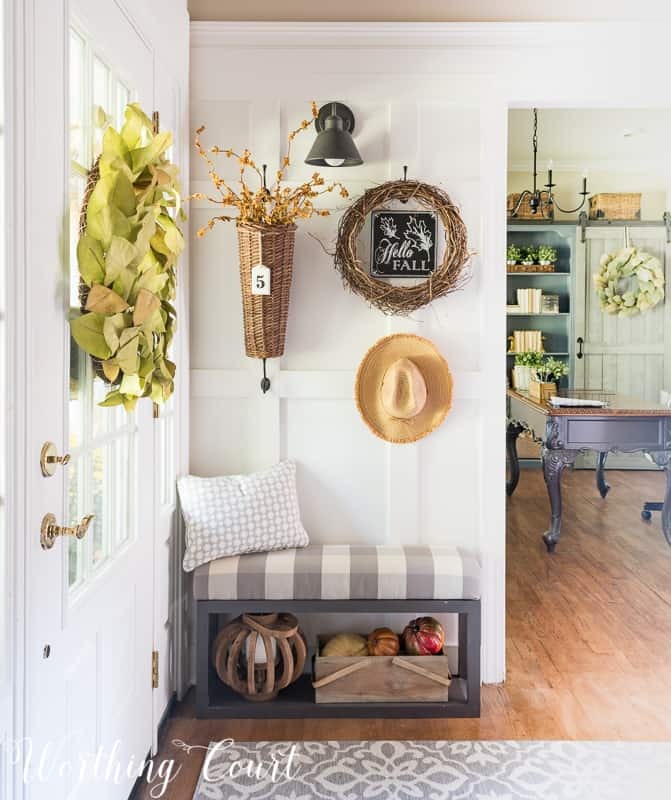 oh wow, your entryway is just gorgeous!!! Love every bit of it decorated for fall! I have a vase that has been sitting on a shelf empty, and I have been trying to decide what to put in it. I love the simple and fun pumpkin stems you have in yours! The foyer is warm and welcoming, for sure. As always, lovely work! The double wreaths on the front door is so smart, mentally and aesthetically. Thanks! What a pretty entryway, Suzy! You have such a great eye for placing items in vignettes! What an inviting entryway! So many beautiful elements! You have such a gift for layer things! I love everything, especially that little bench! you achieved your goal. I think i will be staying a while! Enjoy this beautiful fall season! Everything looks beautiful! I’m glad you used fall colors and I like the lighter tones and simple decorations you used. 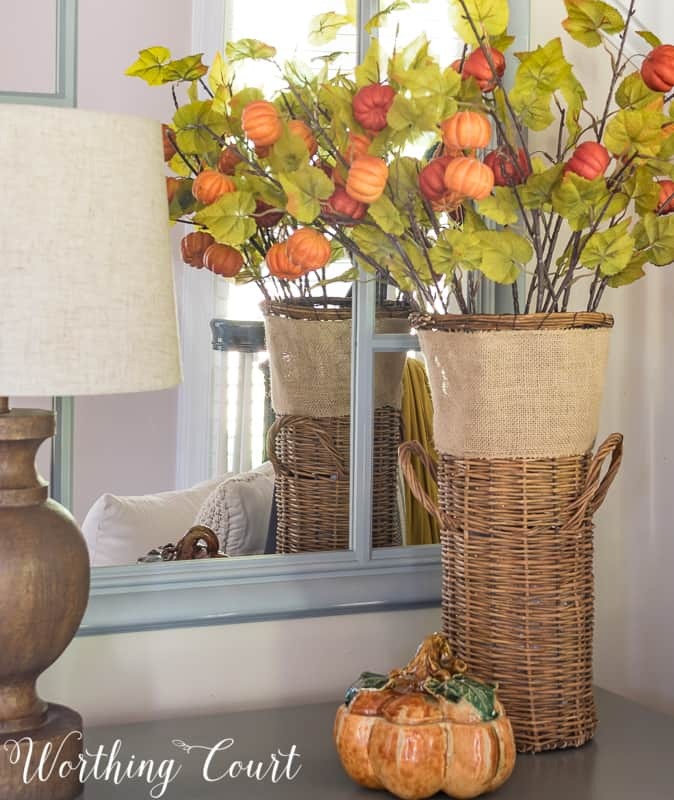 I love the little pumpkin stems in the wicker vase. Is the wide burlap ribbon permanently attached? If not, how do you hold it in place? Thanks! Hi Joan. The burlap ribbon is wrapped around sort of tightly around the vase and then hot glued to hold the ends together. And then I placed one little spot of glue on the backside of the vase to hold the ribbon in place. Just having one spot of glue allows me to remove the ribbon, if I ever want to. Thank you so much. I will definitely try it. I love your foyer. Great Fall colors and perfect for everyone to see. I totally agree with you about the foyer! If there is just one single spot I decorate, it will be the foyer. It’s always the cleanest, too! 🤣 Happy Fall, Suzy!! I find it amazing more people don’t shop at the Dollar store. I can find some of the “cutest” decorations for minimal price. I love the pumpkin stems in the vase – just the right amount of color! My living room and dining room updates are finally finished.. Thanks for the inspiration and ideas! Such a pretty foyer! Wish I had a foyer to decorate….maybe someday. Love the chest in the entryway. That color is awesome. Love the wicker basket on the floor. Would love to recreated this in my home. Beautiful !!!!!! So pretty! Looks quite inviting! My eyes do not know where to look first! EVERYTHING is just gorgeous! Beautiful foyer, love the mirror! Just enough color to draw the eye! I love your blog! I get a lot of great decorating tips! Thanks for the peak! Love everything about your home.